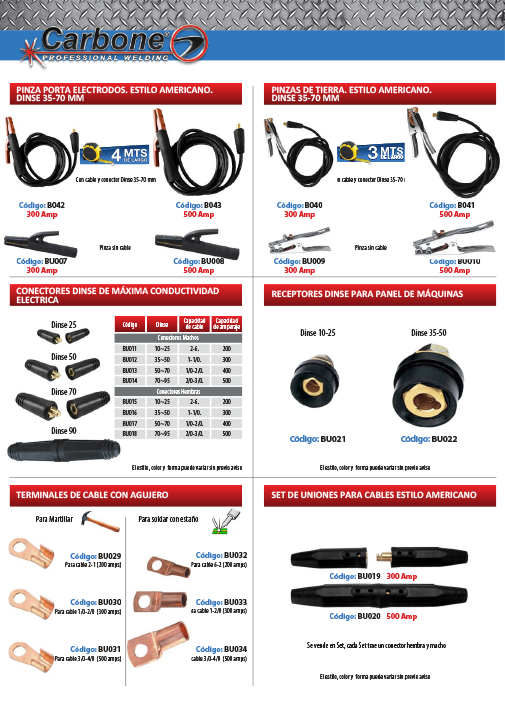 Carbone Panama presents its line of MMA welding accessories. DINSE 35-70 American style electrode holder clamp, American style earth clamps, DINSE 35-70, DINSE connectors of maximum conductivity, DINSE receivers for machine panels, cable terminals with hole, joints cable set. An ultra-flexible cable for coated welder with EPDM of 600 volts, 100 meter length rolls, EPDM insulating rubber material, maximum voltage 600, black insulation, copper conductive material, NEMA 10-50P male plug 125/250V, NEMA 6-50R female connector 50A 2p 220, 220V to 110V adapter. More accessories: portable ovens to heat electrodes, welding electrodes glove, welding apron and sleeves. Carbone presents its new line of machines and all accessories for MMA machines, which can meet the widest range of machines for MMA welding. We offer a variety of machines with various regulations and to perform any work you need.